Plato was a philosopher in Classical Age Greece, and was a close friend and follower of Socrates. Plato, unlike other philosophers of his time, did not think about the natural world, but rather moral qualities and how men should act. This is how he taught, and I’ll give an example through blades. If you remember the last post, I listed the three main types of blades, the Rapier, Katana, and Kopis. These are all incredibly different. Yet they are all swords. If you showed an animal a Rapier and a Kopis, would the animal recognize them both as swords? No. 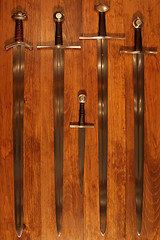 Swords come in all shapes and sizes, from Rapiers to Ulfberhts to Katanas to Kopii. They all must have one thing in common that makes them a sword. Let’s call this thing they share in common “swordness” (for lack of a better word). 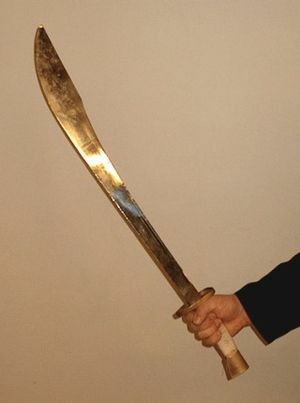 Now a Kopis has extra weight behind the edge for harder blows, but extra weight is not part of the swordness factor: this is proved by the Rapier, which has practically no weight behind the edge. What about a pointed end? Is that part of swordness? 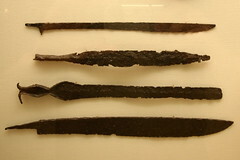 Most swords are rounded up into a point, but there are many swords that have a flat end, for example a type of machete. Does a sword have to be curved? No. Does it have to be made of steel? Nope. Does it have to be very long? Uh-uh. Every sword has a feature that is not definitive in it’s swordness; every sword has something that another might not have. This means it is impossible to to imagine “swordness” as an actual object. No matter what you imagine as this object, another sword, it will still have something that it does not need to have in order to be a sword. I will leave it up to you to find the one thing that is common to all swords, and all swords have to have in order to be a sword. This goes as well for qualities, such as Justice, Kindness, etc. ; you can give examples of Kindness; that man just gave the poor beggar fifty bucks: but you do not have to be giving money, you do not have to do it to a beggar, it does not have to be fifty bucks, in order to be kind to someone. But there is something in common with all these examples of kindness; there is a definition of “kindnessity”, just as there logically must be something in common to all swords, there must be something in common to all acts of kindness, of all acts of Justice, of all things that are beautiful. Plato said that men should use their reason not to find the natural things of this world, what this is made of and why it works, but we should use our reason to find these things that are pure Justice, Kindness, Beauty, etc., and then use these and live by them. This entry was posted in Uncategorized on November 12, 2013 by Captain Belaq. A sword is a sword right? You use a sword differently from an axe right? You use all axes like you use all other axes, and you use all swords like all other swords right? Dead wrong. There are swords that sometimes combine two of the above, but the three basic motions can be categorized into three basic swords, the Katana, Kopis (or Falcata), and Rapier. The Rapier was developed around 1500 AD, and was kept for a self-defense weapon that was not too heavy to carry around everywhere, yet beautiful and simple. It was a fast stabbing weapon, and required a good amount of skill to use. These swords were normally about half an inch wide, and around 3+ feet long. The blade was also very thin, and very flexible, which required a high quality steel. The edges were normally not sharp. If a rapier-wielder went up against an enemy with a heavier sword, the rapier-wielder would be able to stick his enemy full of hulls and withdraw before he even managed to swing his weapon. However, in a heavy charge in the middle of battle, one cannot withdraw or have fancy dodging moves in all the turmoil, and would fail against a heavy charging onslaught. 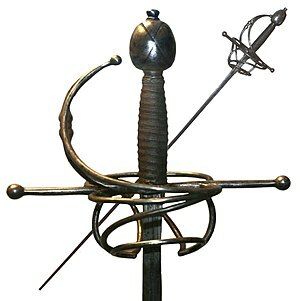 The long, tapered and thin point of the rapier was perfect for stabbing, and practically useless for anything else. The Katana Was long, fairly thin, and curved Japanese weapon, highly prized by the Samurai. Both the Katana and the Kopis dealed damage by the edge, not the point. However, the Katana slashed while the Kopis hacked. When the Katana was swung correctly, the curve of the blade followed the circular path the arm made around its body, which means almost the entire length of the Katana’s cutting edge is slid across the limb. This is cutting: where the blade is slid across the limb. This is normally a cleaner, faster, and more precise way to kill. There is practically no sparring or long-term dueling, just slash slash slash and off goes a head. It took quite a bit of skill and drilling to use a Katana to its full potential, to train the muscles to always slash in the same basic strokes. The Kopis, or Falcata, was a short, heavy, single-edged chopping weapon, basically a limb-chopping machete. Unlike the Katana, the Kopis did not slash, it hacked. The Kopis did not need particular skill to use; in needed muscle. Wide area of swing + incredible weight = Incredible hacking power. It could hack through limbs, necks, and even if it didn’t puncture armor, it would sure darn decimate the bone underneath. The Kopis was basically a version of an axe. Rather than slashing, or cutting, where the blade is drawn across the limb, the Kopis hacked or chopped, aiming a heavy, straightforward blow that was pressed directly against the limb; no sawing motion or clean cutting. This enabled the user not to worry about slashing the right way or watching out to deflect the opponent’s move, so that he could just focus on creating more force behind the blow. leaf blade. Or, be slightly curved yet with a good deal of weight, so there would be the power of the Kopis with the slashing capability (the fastest and cleanest way to cut) of the Katana, like the Chinese Dao. Which type of sword would you prefer? Are you a quick person, not with much strength, but with good reflexes? Do you like precision, efficiency, and speed, mixed with a sense of flow and fluid motion? Or do you prefer the focus of raw power, something you could swing mercilessly? Comment below and let me know! Rivers, Burials, and in the dirt, grounded. The mighty blade, who’s secret was lost throughout history? For its secrets, hidden and shrouded in mystery, lie. Is where the title “Ulfberht” is hid’n. And began to unravel its secrets, until they were cleared. But still mysteries remain, and the lack of knowledge, in our mind, hurts. Who was the smith? Why was the name? This is lost to history, indeed a great shame. This entry was posted in Uncategorized on November 10, 2013 by Captain Belaq. When you read “leaf blade” right off the bat, you might imagine a blade as thin as a leaf. No, I’m talking about leaf shaped blades. This is a blade that at the hilt is fairly thin, then as you progress towards the point, widens. The climax of the blade width is normally about 2/3rds of the way from the hilt to the point. Once the width reaches the climax, it tapers quickly into the point. Probably the most recognizable example of a leaf-bladed sword is Bilbo’s little sword, Sting. This blade shape was originally designed by the Greeks, who needed a short sword that they can pull out in the case of the phalanx formation being broken. 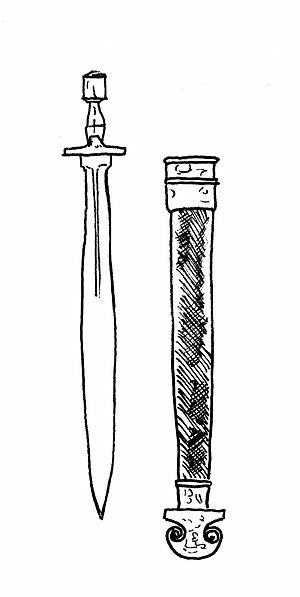 The Kopis served this very well, but sometimes the Greeks needed something they could stab as well as slash with, something slightly shorter that they wouldn’t risk hitting their buddies with. Something small, but heavy, wide enough and heavy enough for a hard slash, but thin enough to be a stabbing weapon. Thus, they cam up with the idea for a leaf shaped blade, heavy enough at the climax of the width to give hard blows, yet straight and tapered and short enough to give quick, deadly stabs. The Greeks called their leaf-bladed swords “xiphos“. Classical age Greece was right in the middle of the transversion of bronze to iron, and so both iron Xiphos swords and bronze ones were used, practically side-by side. An interesting fact, is that bronze swords were cast into a mold, whereas iron ones were forged into shape. It took a lot more work to forge iron than to cast bronze, but bronze was more expensive, so they cost around the same, which in turn meant that it was your personal choice. The sword could be used really however one liked; it was thick enough for hacking but tapered enough for stabbing. It was the ideal secondary weapon. In the chaos that could ensue after the breakup of a phalanx, practically any motion you made could damage the enemy. This entry was posted in Uncategorized on November 5, 2013 by Captain Belaq.